Guns N’ Roses leader Axl Rose has injured himself in Moscow. GNR kicked off their 2012 European tour with two shows in the Russian city last weekend and, according to Komsomolskaya Pravda, Rose hurt his leg when he fell off a table while dancing at the trendy club Premier Lounge after the second Moscow concert. The Sun reports Axl’s agent revealed that the rocker had slipped and pulled a hamstring. Rose wrote "Can U say HemaToma?!" 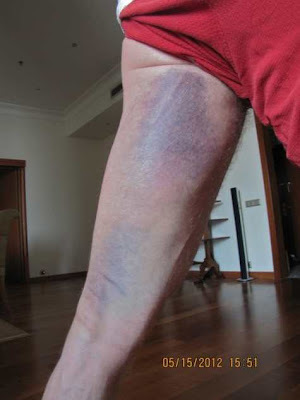 when he tweeted a photo of his injury, which reveals extensive bruising to his leg. GNR’s European tour continues Thursday with a show in Dublin, Ireland; an 8-date UK tour starts Saturday in Nottingham.